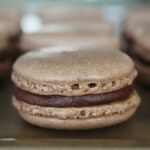 Chocolate week continued with no shortage of delicious confections. Although this week did not convert me into a chocolate lover, I definitely have a greater appreciation for the art and work involved. 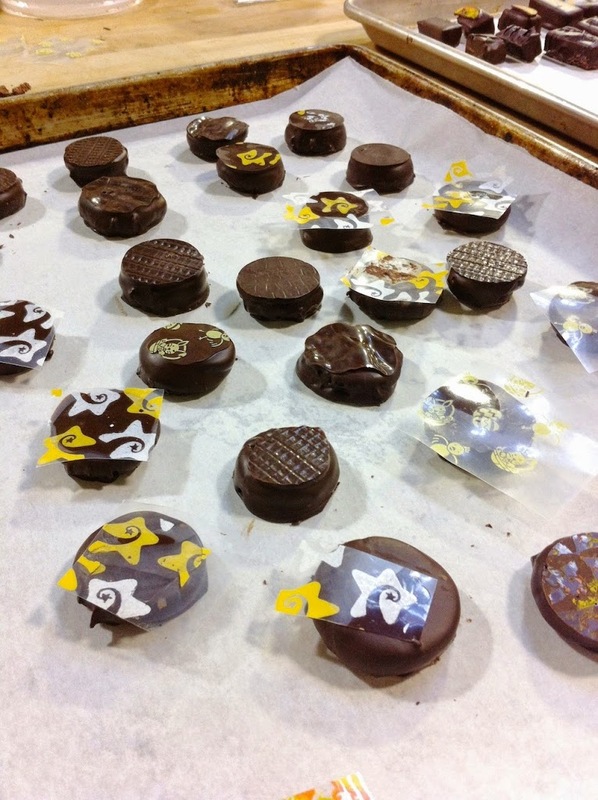 Then enrobing the Palet d’Or in dark chocolate and using transfer sheets to create designs or patterns. Once dry, you pull off the transfer sheet and the pattern stays. Next up we moved on to truffles. 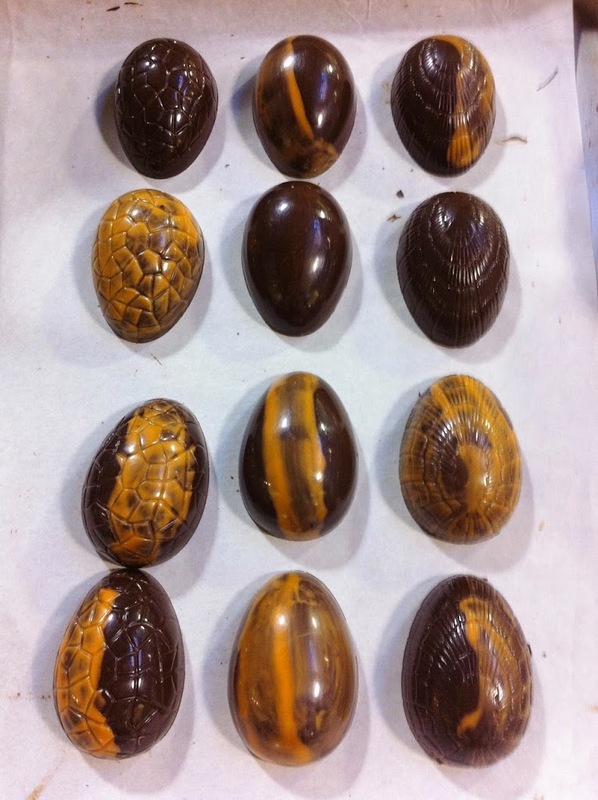 We made 3 different fillings for these, an chocolate egg ganache for the milk chocolate ones, a white chocolate passion fruit ganache for the white chocolate, and an orange ginger caramel for the dark chocolate ones. 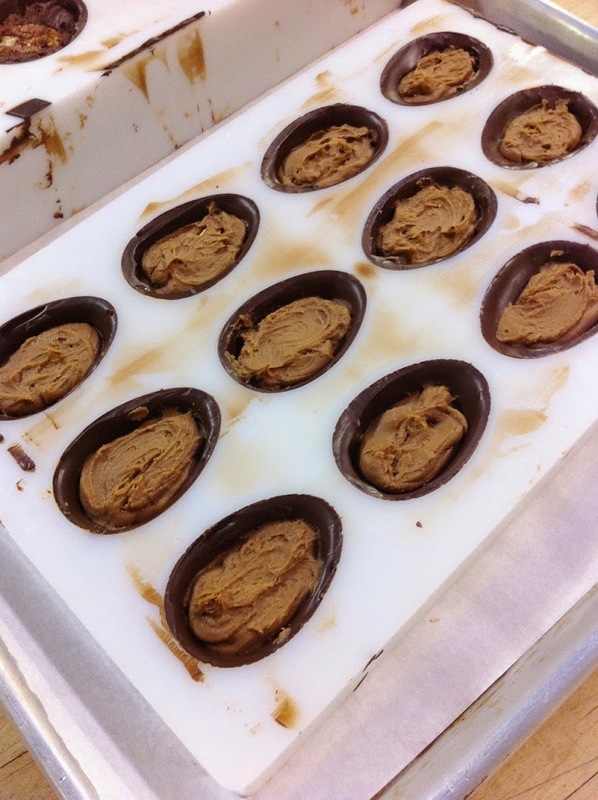 The shells themselves were pre-made, so we just had to fill them with ganache. 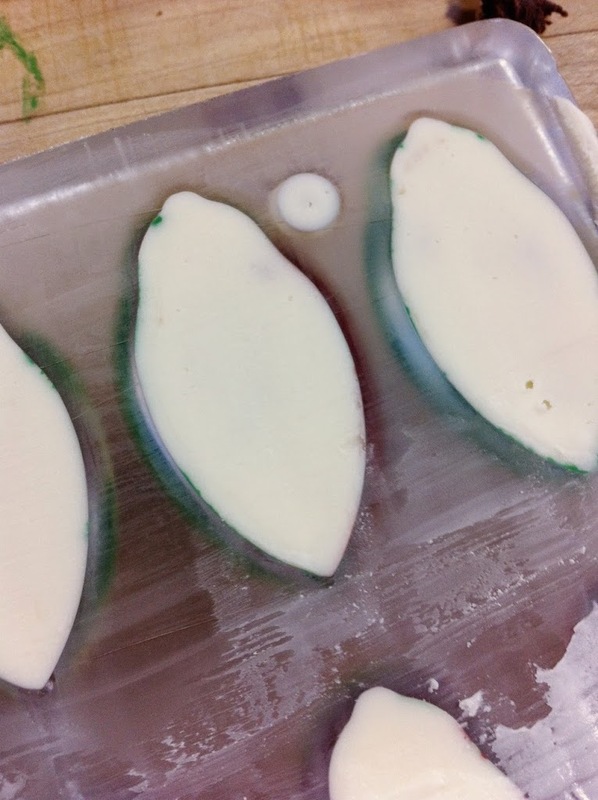 For some reason I think we changed the recipe for the white chocolate one… the curriculum tells me it was passion fruit, but I recall it was lime/lychee. I didn’t make that one so I can’t remember! At any rate, it was really good, considering it was white chocolate, which I don’t particularly care for. The dark chocolate ones with the soft orange caramel were my faves. We capped all of these guys off with chocolate to seal them in and left them to set overnight. 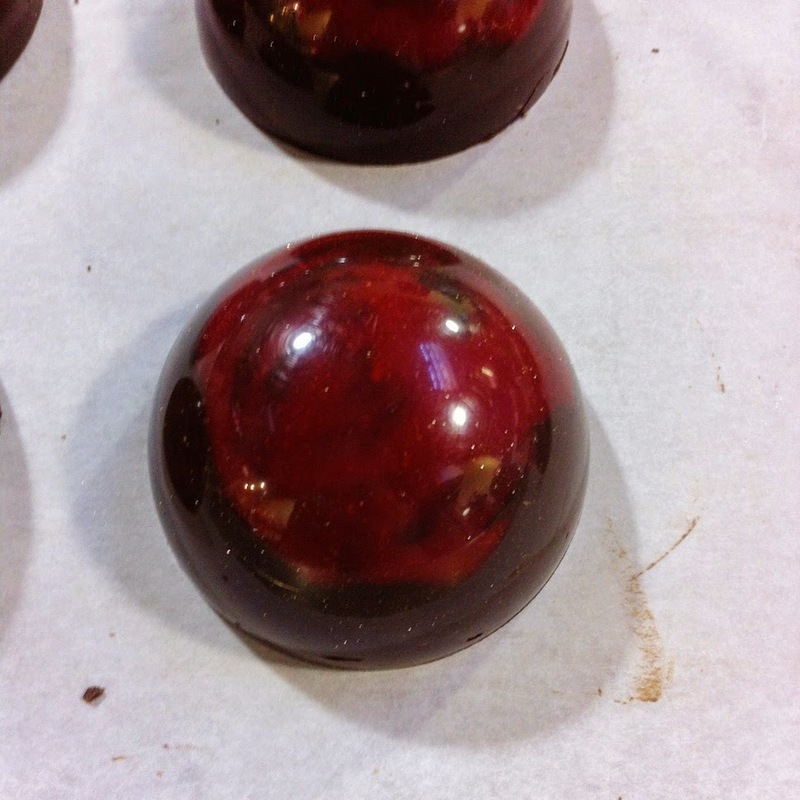 We had some leftover raspberry ganache which we used a melon baller to form into truffles. 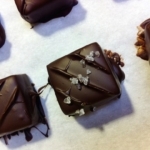 They then got rolled around in icing sugar, cocoa powder, or white chocolate nibs. That is the price you pay for creating delicious chocolaty confections! We were all pros by the end of the week. 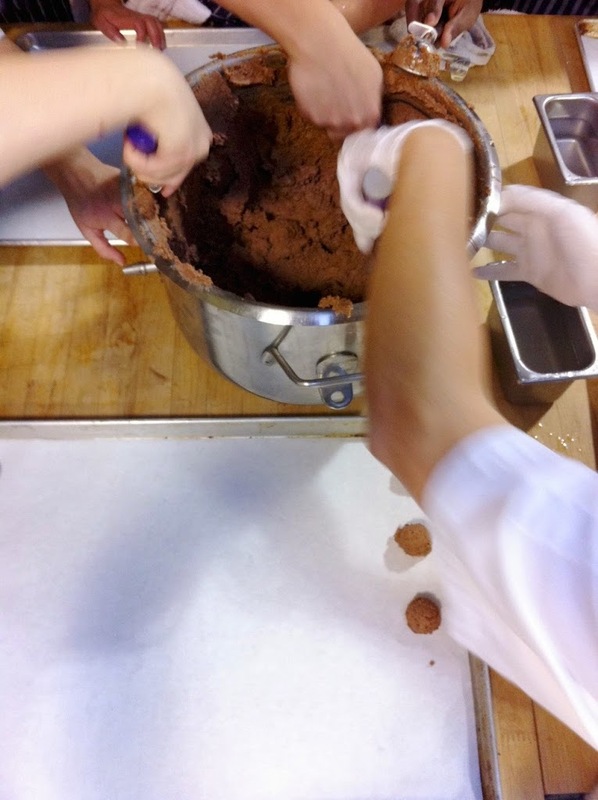 With the 3 tempered chocolates, we started to enrobe our truffles from yesterday. The white chocolate ones, filled with white chocolate ganache got coated in white chocolate and rolled in toasted coconut. I am not a fan of white chocolate, but these ones were GOOD. 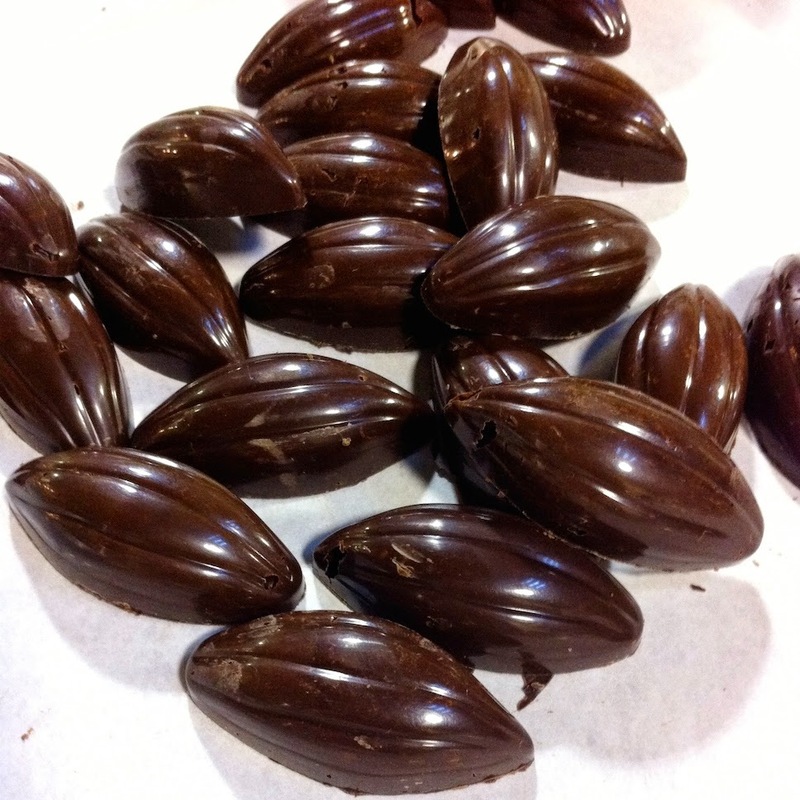 The milk chocolate ones, filled with the milk chocolate egg ganache got coated in milk chocolate and rolled in crushed nougatine (I think). The dark chocolate ones, filled with the orange caramel got coated in (you guessed it) dark chocolate and rolled in crushed up gingerbread crust and something else (I can’t remember :(). These were my favorites though! Yum. 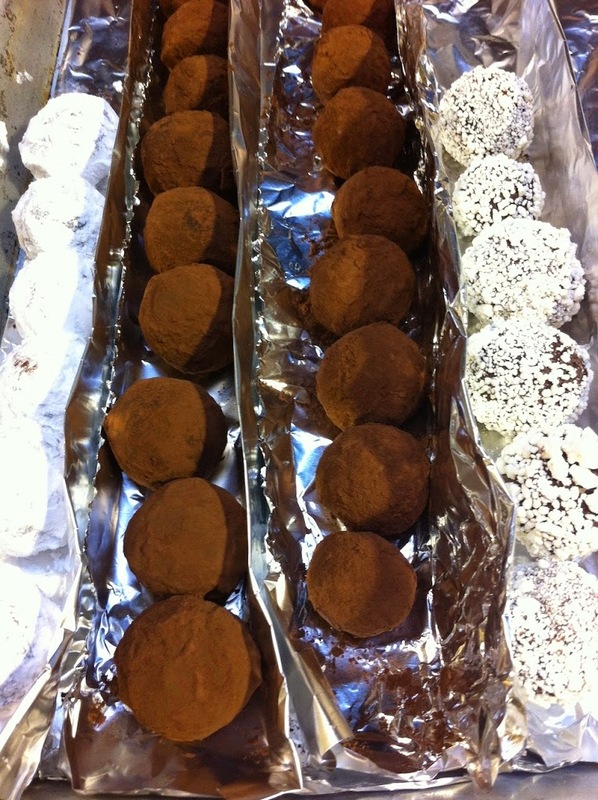 We also got to try a cool technique of creating spikes on the truffles by rolling a freshly coated one over a metal cooling rack. This texture was my favorite by far! Here’s a pic of the ones Lindsay did. 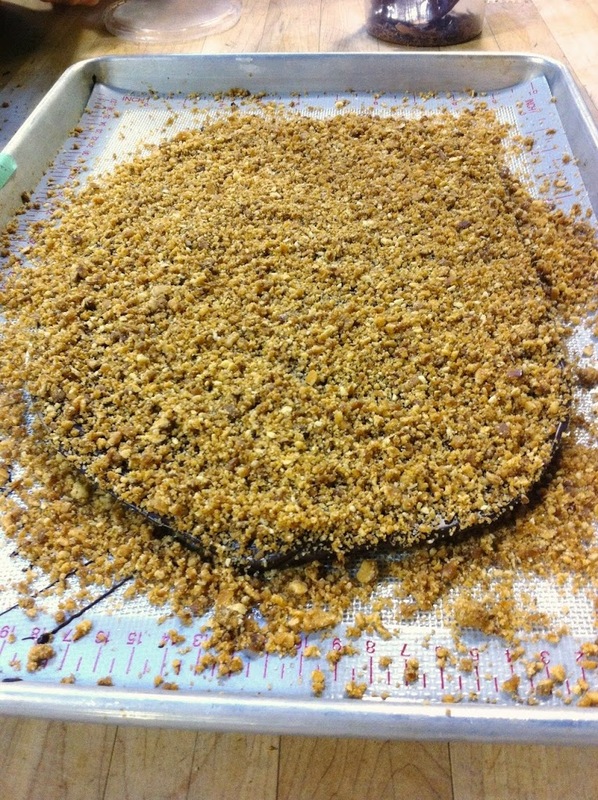 After the truffles were done, we moved onto the Pecan Butter Crunch. I say that as if I remember the exact order of things… I don’t. It’s Sunday and I barely remember what I did yesterday, nevermind Wednesday so I’m using the order of pictures as a guide. I figure they’re more accurate than my memory. I was not incredibly enthused by this product as we were making it but holy CRAP this is the best thing we made all week! 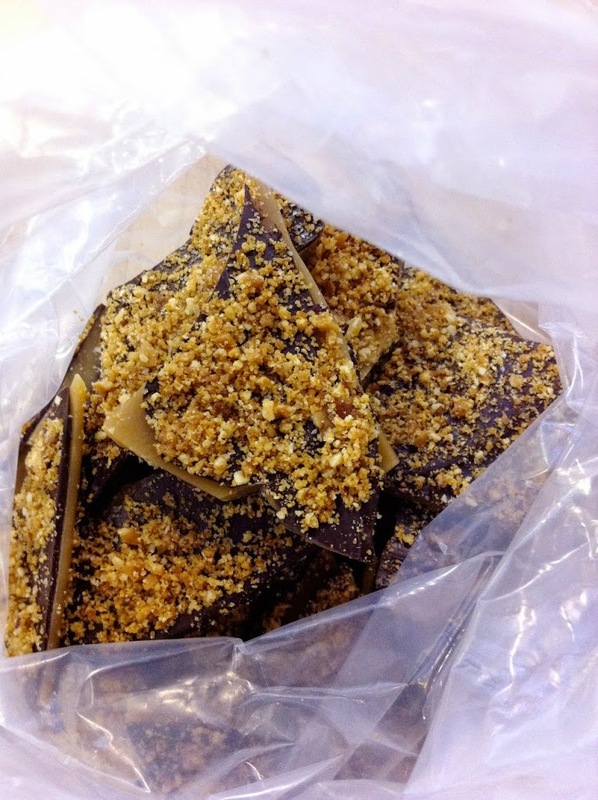 I don’t generally like crunchy toffee things, but this was different. It was a soft kinda crunchy that just melted in your mouth. SO GOOD. Here’s a shot of the chopped up pieces. I’d like to say I took this entire bag home, but this is the stuff we donated :(. 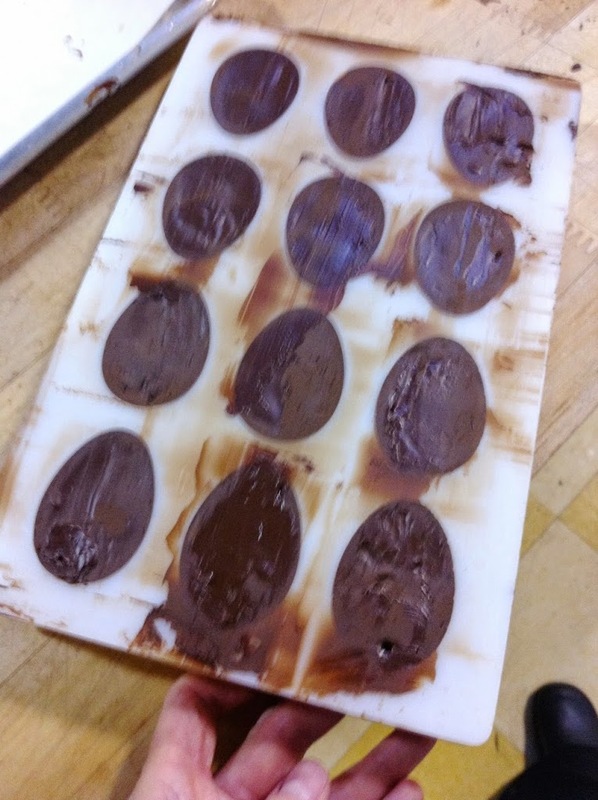 After that we moved onto molded chocolates which would be the focus for the next two days. Making these is a very detailed, time sensitive, multi-step process… only some of which I remembered to get pictures of. First step is cleaning and buffing out your mold to make sure there is no dust or marks or anything. 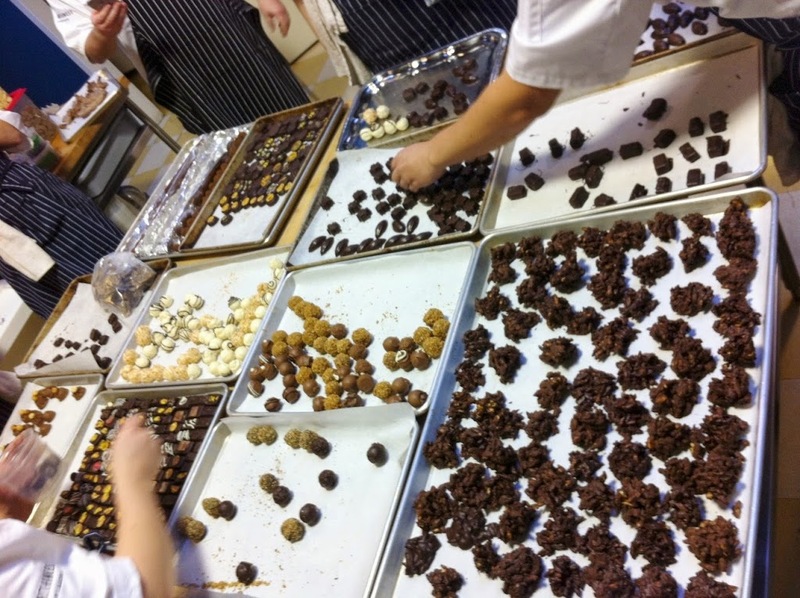 You want your chocolates to be clean and shiny when they come out! To do this we used a cotton make-up pad. 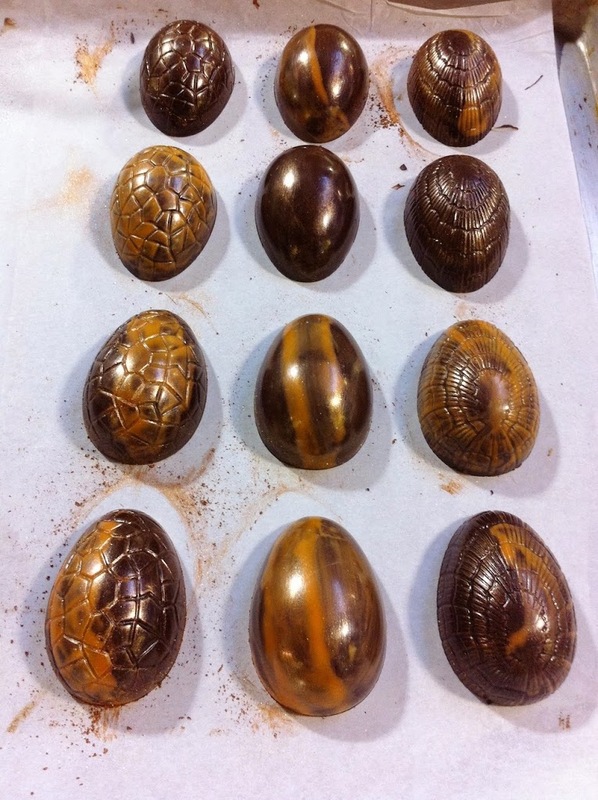 Next step is painting chocolate into each mold with a paint brush to ensure you get all the cracks and corners. 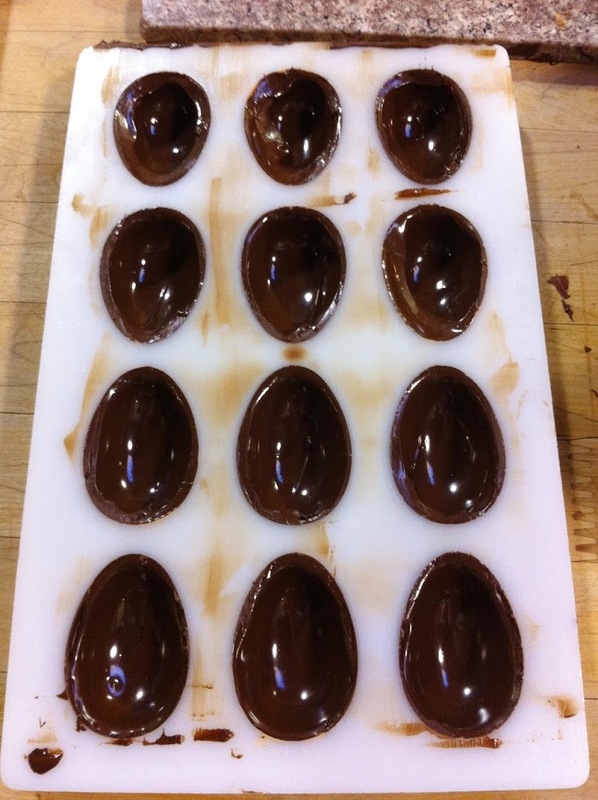 Then you fill the entire thing with chocolate, tap the sides to get the air bubbles out, and pour all the chocolate out so it leaves a shell. 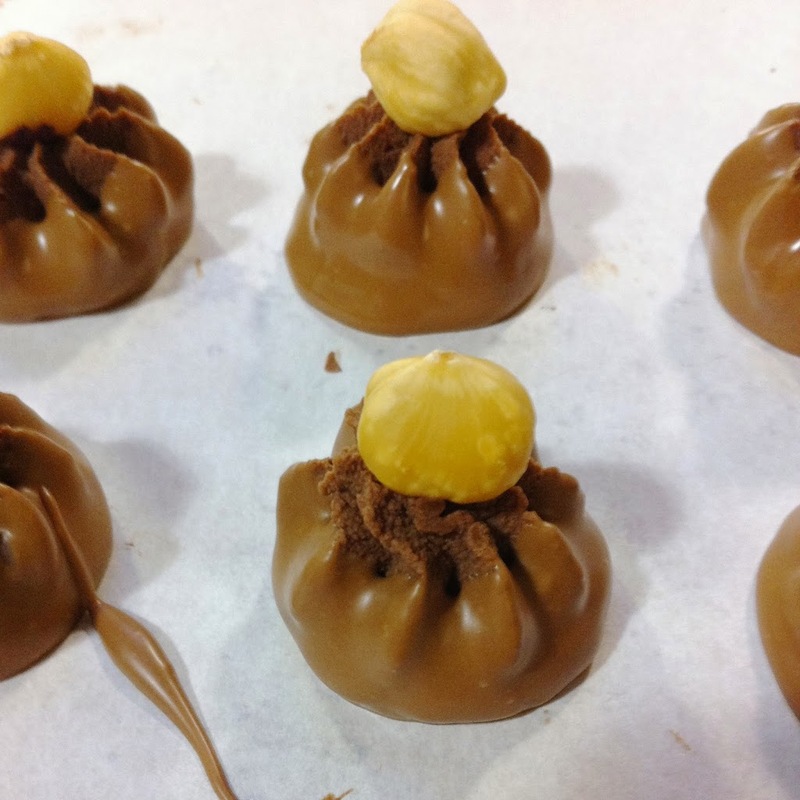 Let that shell set for a bit and fill the chocolates with a ganache, then pour another layer of chocolate over, let it set a bit and scrape it off. As you can see I missed a LOT of pics in those steps. I have better pics of the process tomorrow. This was our first go at making these so we made a lot of mistakes and learned a lot. 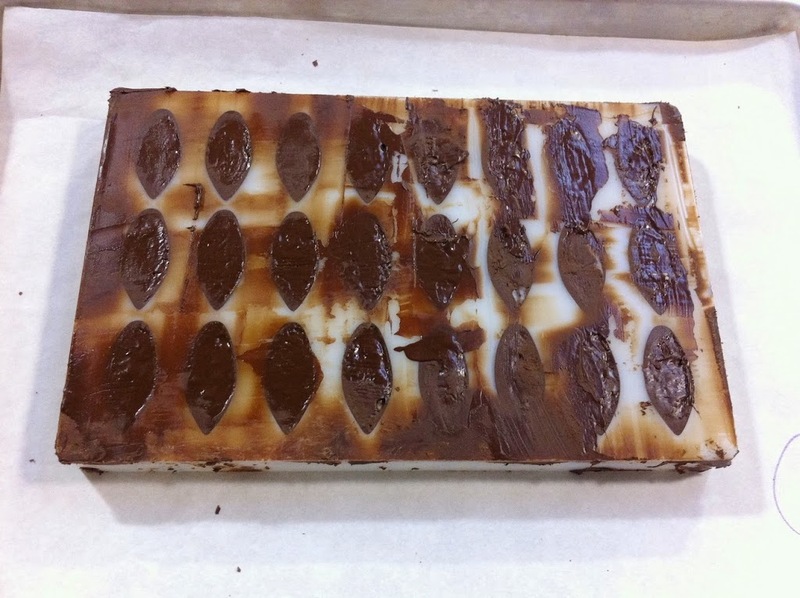 We overfilled our chocolates with ganache, so had to do some patching after the final scraping which is why the mold above looks so messy. We also didn’t do a great job of tapping out all the bubbles, so you can see them in the final products below. After that we made Nougat Montelimar which I didn’t get a pic of during the process and we haven’t cut into it yet, so look for pics of that next week. You can google what it looks like if you’re curious! 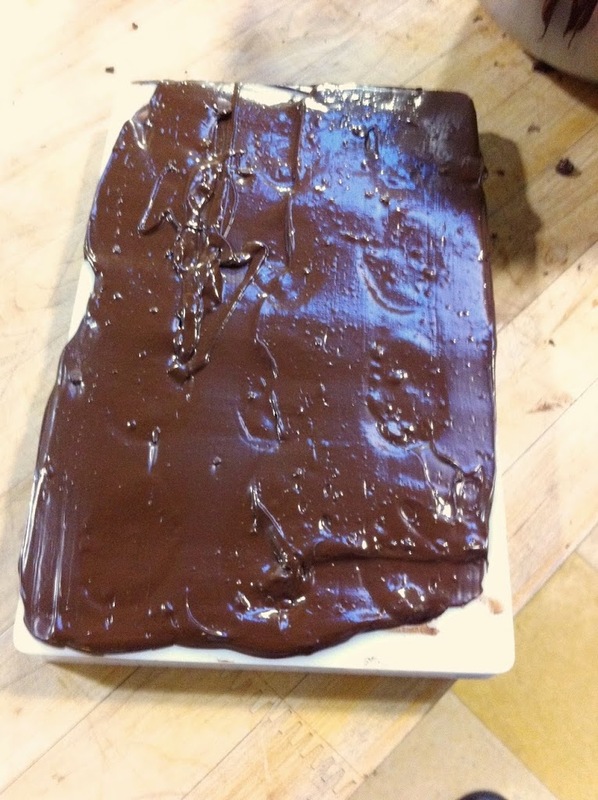 Oh and we also made our own ganache to be used in chocolates tomorrow. 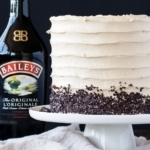 I made a milk chocolate and coffee liqueur one. This was the last official full day of chocolate and I’m happy to report that both Lindsay and I were way more comfortable with tempering the chocolate and relied more on feel than temperatures. 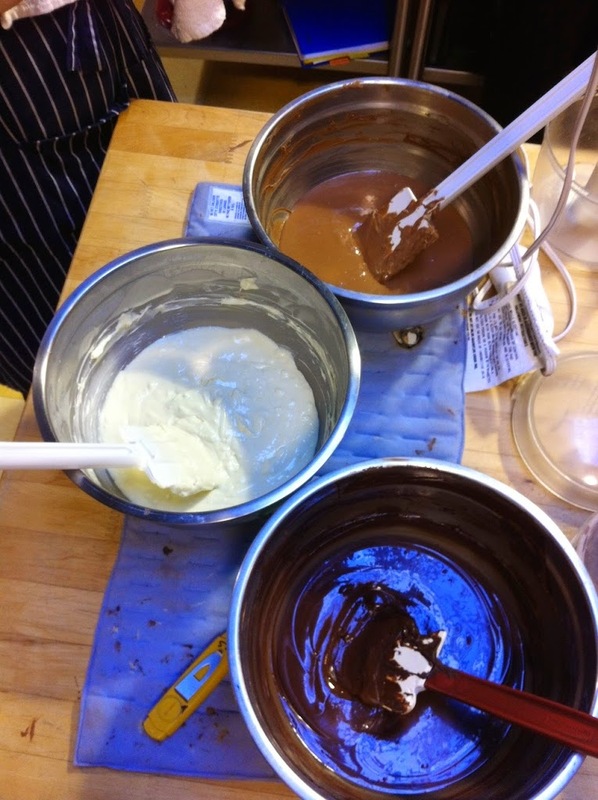 Putting down that thermometer and judging the state of the chocolate by look and feel was a huge accomplishment. 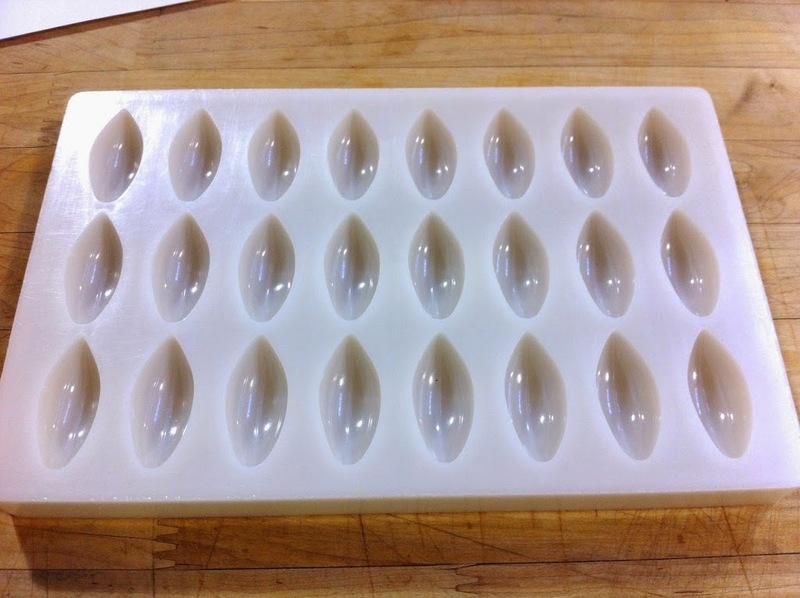 Alright, so here’s some better progress pictures of making molded chocolates. 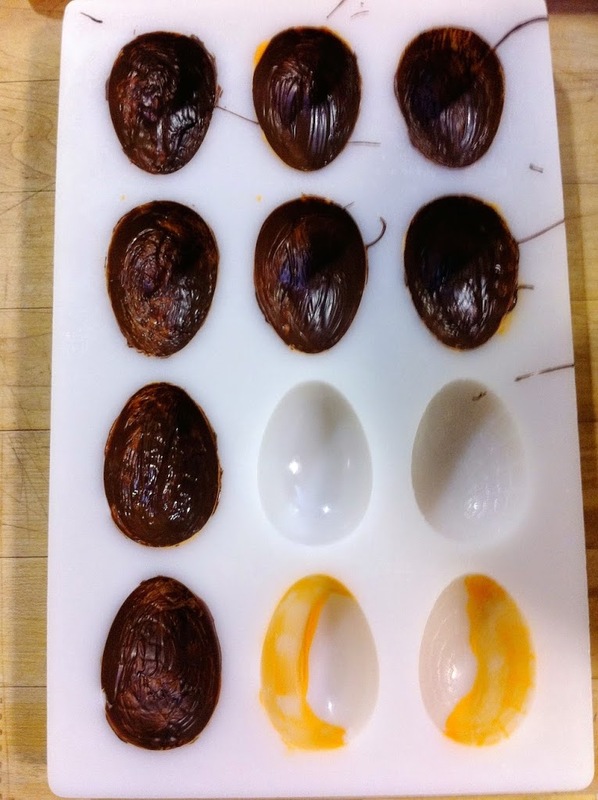 We also learned about about painting on chocolates using colored cocoa butter. 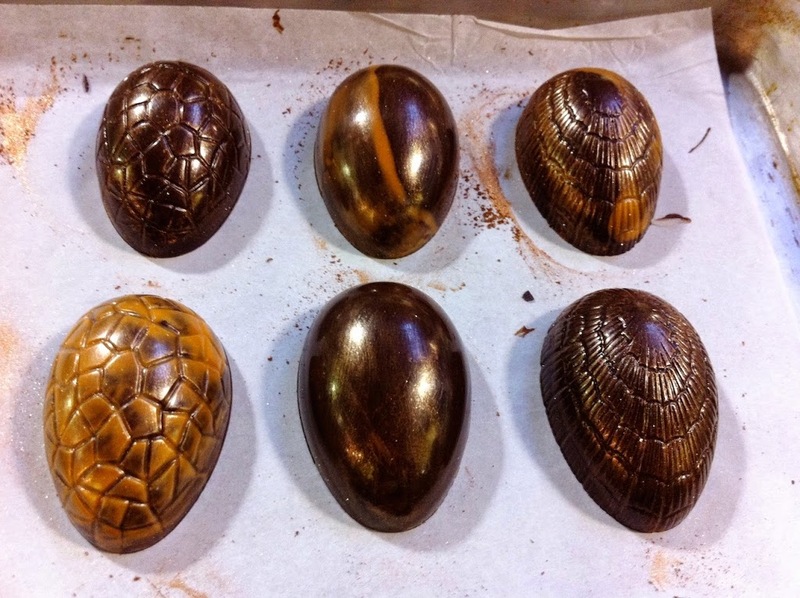 Here you can see the empty shells that have been painted with chocolate. All of them first got painted with a bit of orange cocoa butter (not the dark orange I was hoping for), then painted with dark chocolate. I left a few without the orange to see what they’d look like. 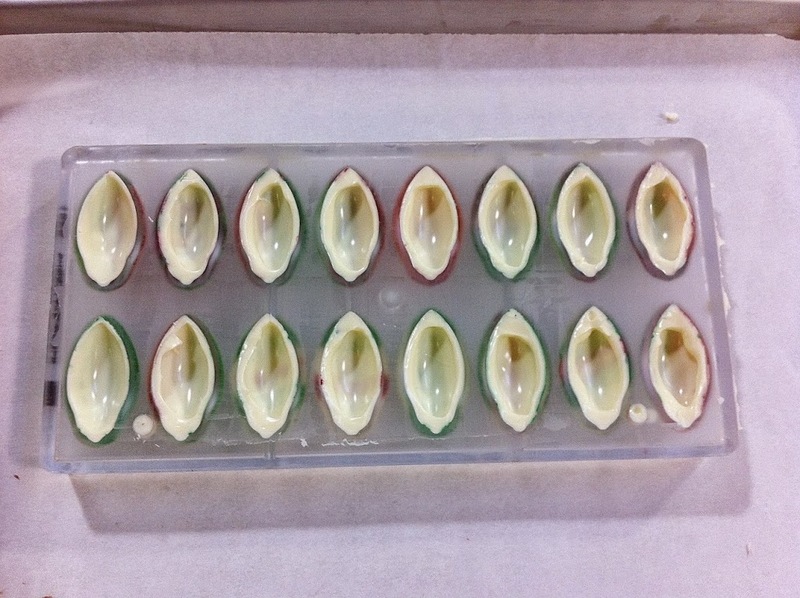 Next step was filling the shells. This was our 3rd go at this and we finally started to get the hang of it. 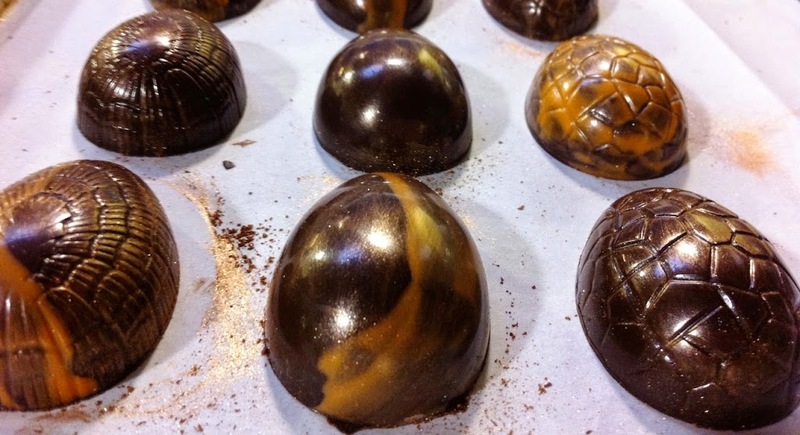 I filled these with my chocolate coffee liqueur ganache and added a toasted pecan to both fill in the shells a bit more and tone down the sweetness. …and scraped it off. Sorry for the blurry pic! We did a much better job at these and only had to patch one or two. 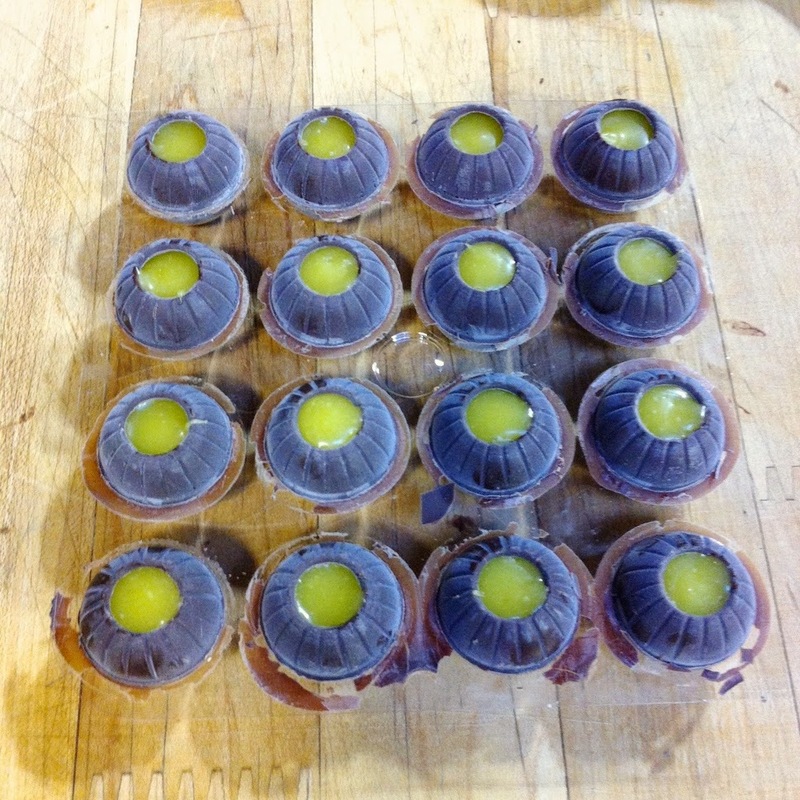 We placed them upside down on a sheet pan and put them in the fridge to set. I wasn’t really happy with how they turned out. In fact, they looked quite hideous initially and I was hoping for a darker orange! We brushed them with some bronze luster dust and that was basically a game changer. They looked amazing after that! Crazy what a little sparkle can do! 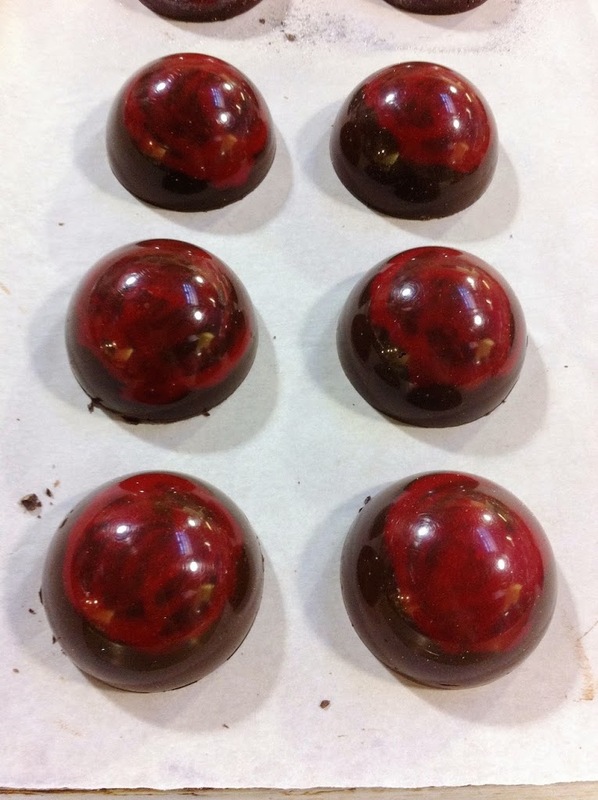 Lindsay’s chocolates came out stunning and adding luster dust to these actually detracted from their prettiness so we axed that and promptly at the luster dusted one to destroy the evidence. Sophia brought in some of her own molds and did a beautiful job painting them. So pretty! 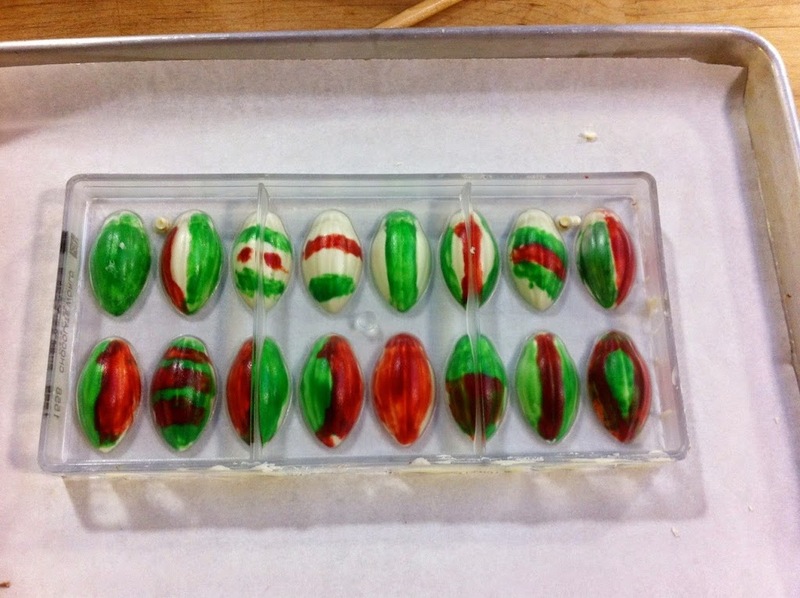 After our first round of successful chocolates, Lindsay and I were excited and inspired and wanted to do something Christmas themed. 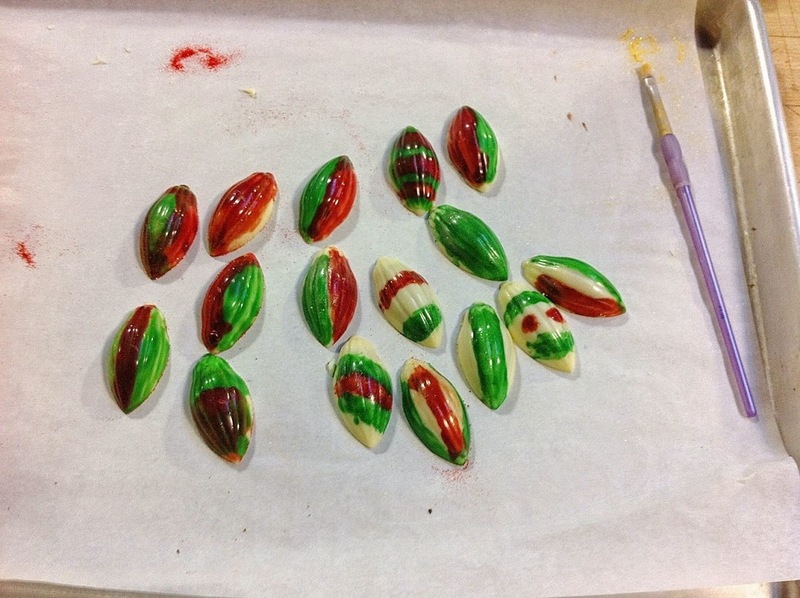 There was a mold that would work perfectly for Christmas ornaments and we decided on white chocolates with green and red accents and a touch of gold luster dust at the top of the ornament. We were just a wee bit excited about the prospect of these… more than you’d think is acceptable for women in their 30’s. 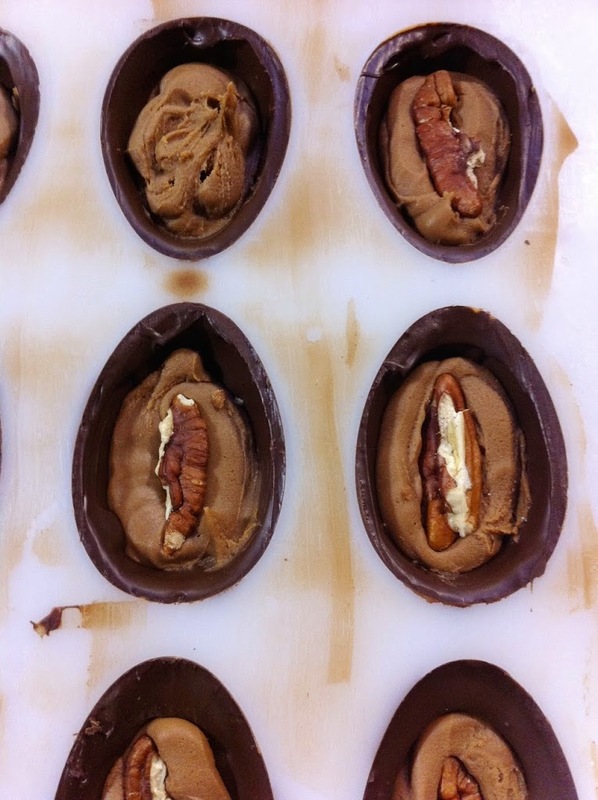 So, same process as above, paint the shells with the colored cocoa butter then coat with white chocolate. I took the top row, Lindsay the bottom. 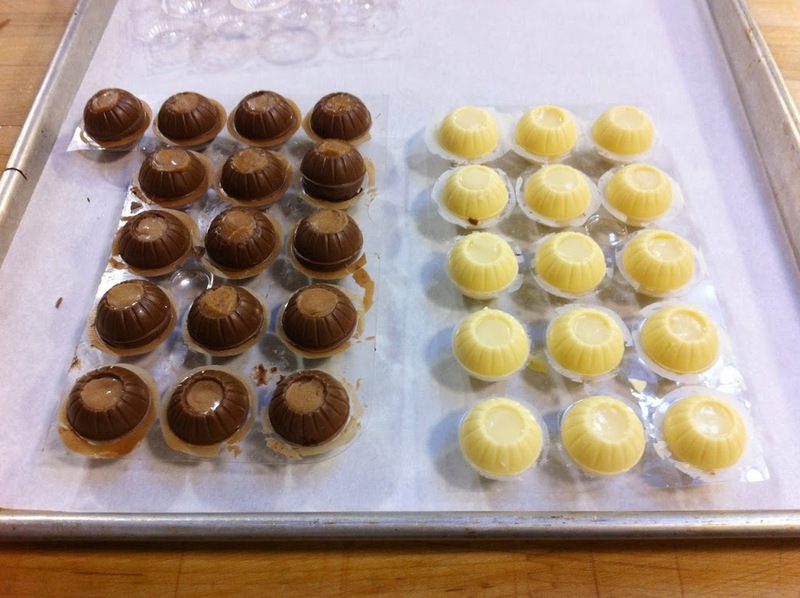 Aside from their less-than-appealing esthetic these were the best chocolates we’ve coated so far! Clean and even. 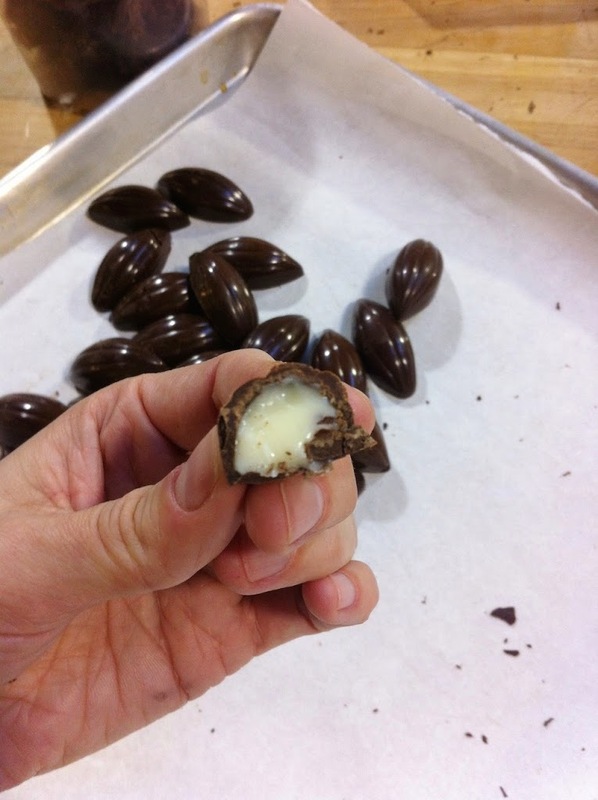 Filled with ganache and capped with more white chocolate, I don’t think we had to patch any this time! Practice makes perfect for sure. We’ll be doing molded chocolates on our Final so I’m sure we’ll need to get in another round or two to make sure we’re on top of it. So these chocolates that we’d built up so high in our heads were a huge disappointment. I mean, look at these suckers… Not even luster dust could save these guys. Oh well, we tried! And we got more practice in, which was great. After everyone was done, we pulled all of the chocolates we’ve been making all week off the racks and were able to take 2 dozen home each. There was probably about 1500 chocolates total! Crazy!! Once the chocolates were packed away, we moved onto some housekeeping tasks. We needed to create a bunch of brioche bread for something we’re doing next (?) week. 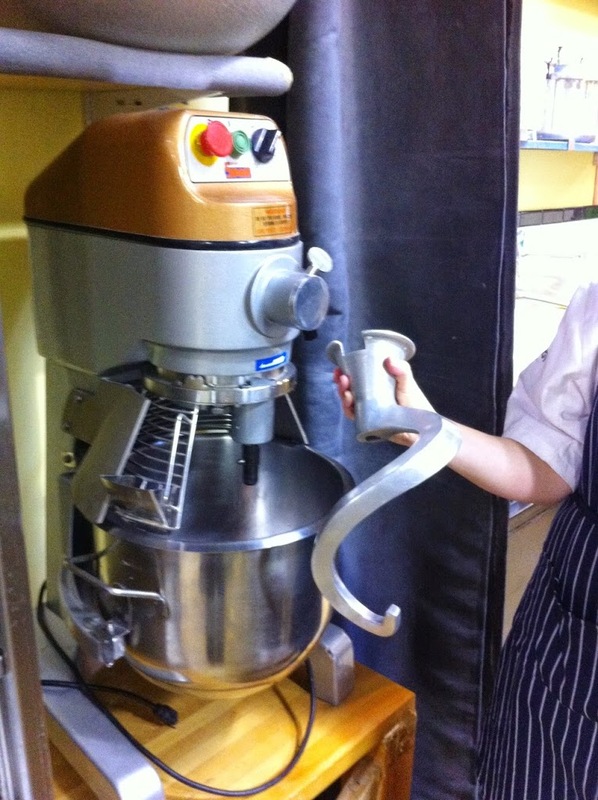 We 4x each of the recipes so they were huge at we got to use the HUGE mixer. Seriously, look at the size of that dough hook! 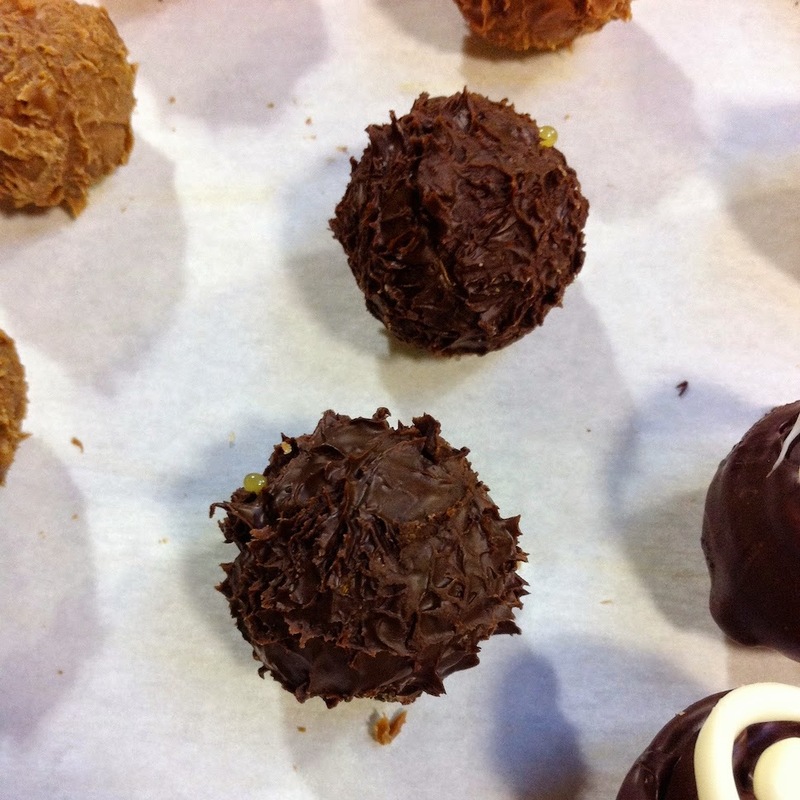 After that, we made rum balls with the leftover ganaches and some cookie and cake scraps. 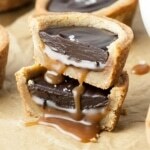 I’d be lying if I said these were appealing. It was quite a mish-mash of stuff in these, but I’m happy not to see anything go to waste. On Friday the focus was marzipan modeling. 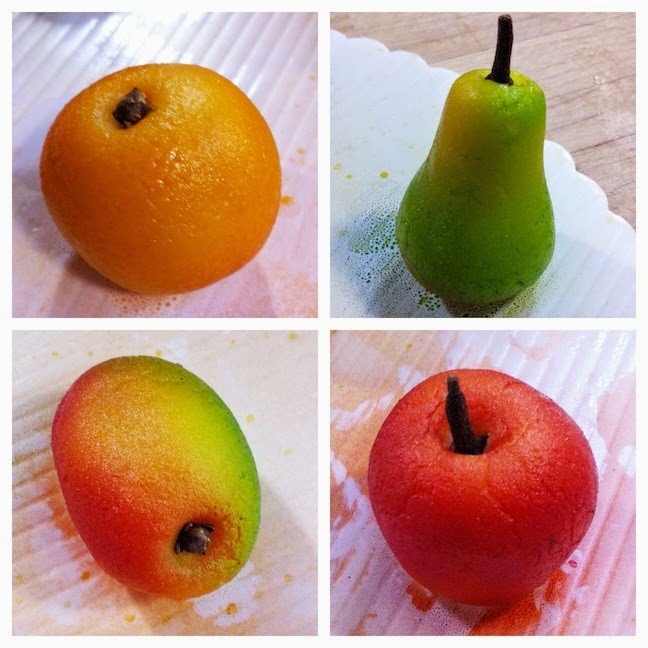 We learned to make different fruits and how to airbrush them with color. 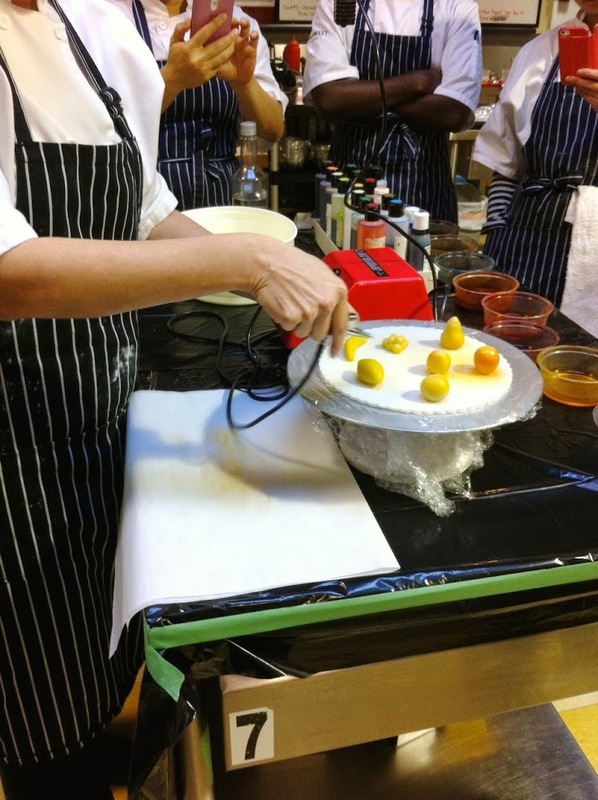 …and Chef Stacy demoing how to do it. 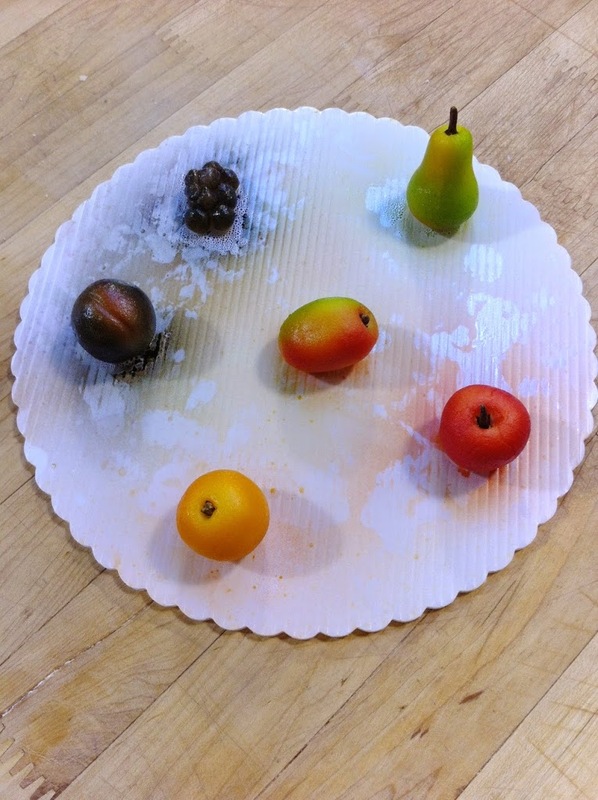 I made a pear, apple, orange, mango, plum, and some grapes. The plum and grapes were total duds. The color turned out really black on them! I’m most happy with the orange, I think it looks awesome! But I got the most/best feedback on my mango which made me happy. 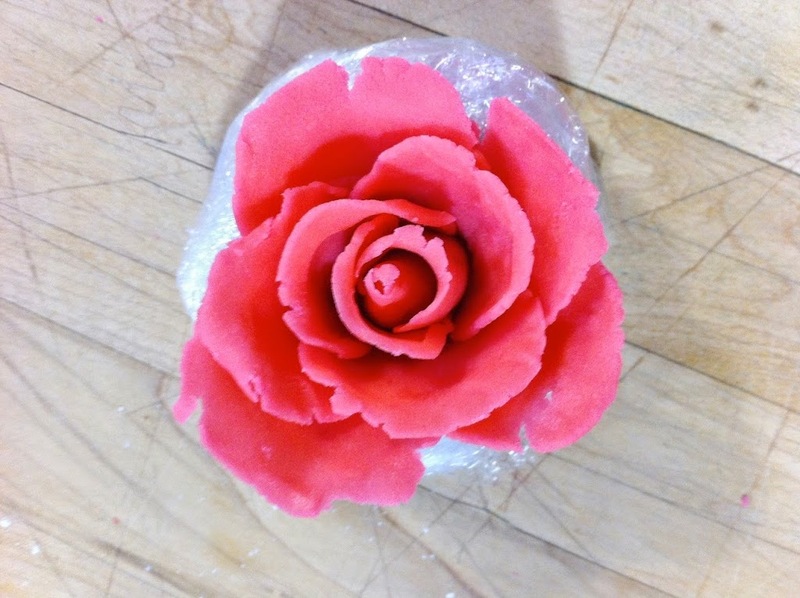 After the fruits, we also learned to make a marzipan rose. 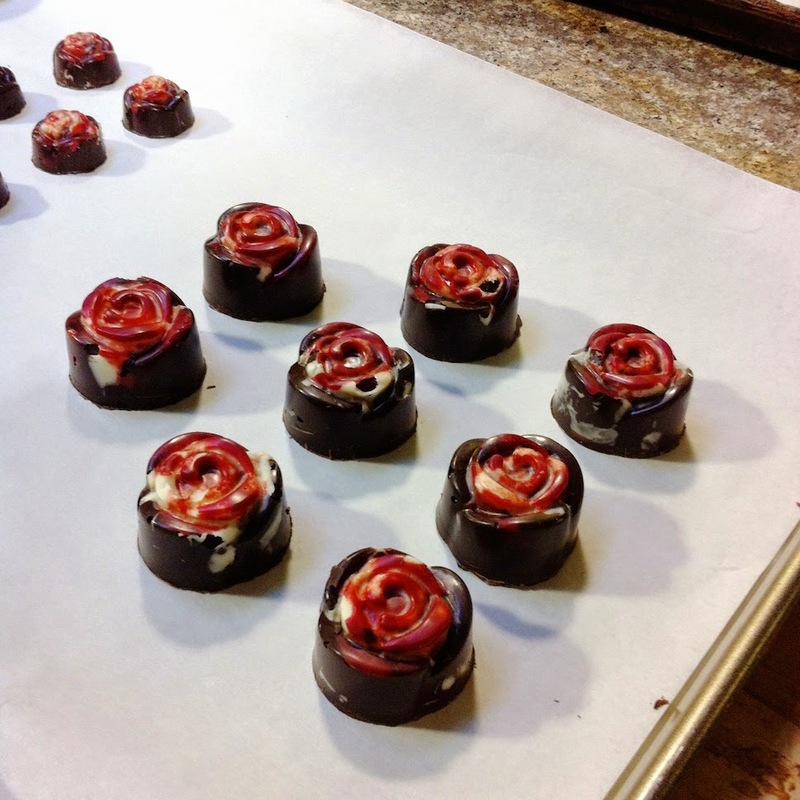 I had made fondant roses before, but it was ages ago. Probably about 5 years ago when I took the cake classes at Michael’s. We used a bit of a different technique there, which involved a sponge, so I was happy to learn a new way to do them. These guys really take practice. My first one didn’t turn out so great so I redid it. 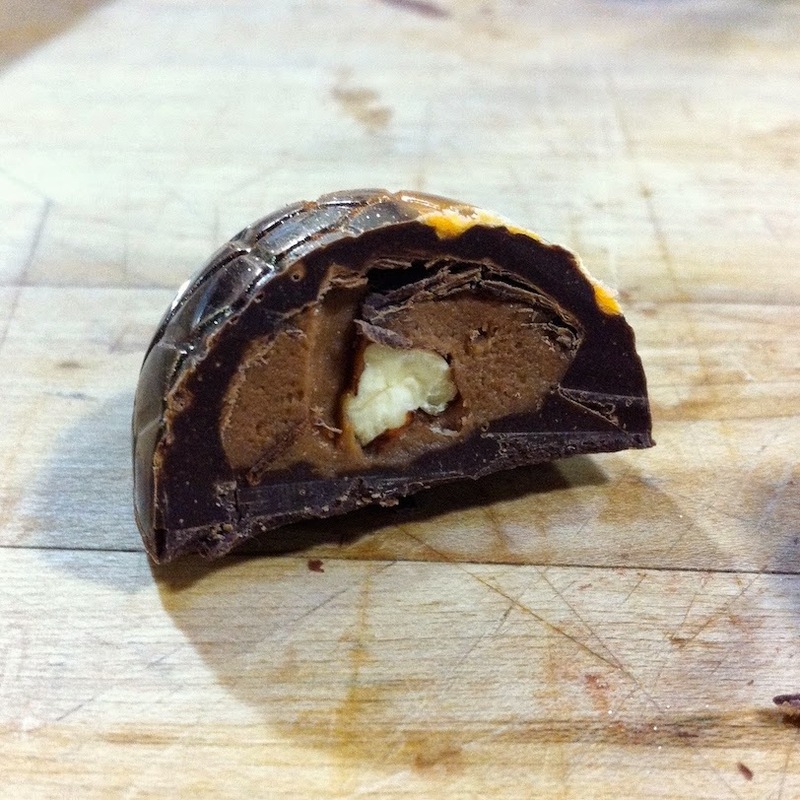 This one turned out much better, but the marzipan was getting pretty dry and cracking. We’ll have to make one of these for the Final as well, so more practice will be needed here! Thankfully this is something I can easily do at home. 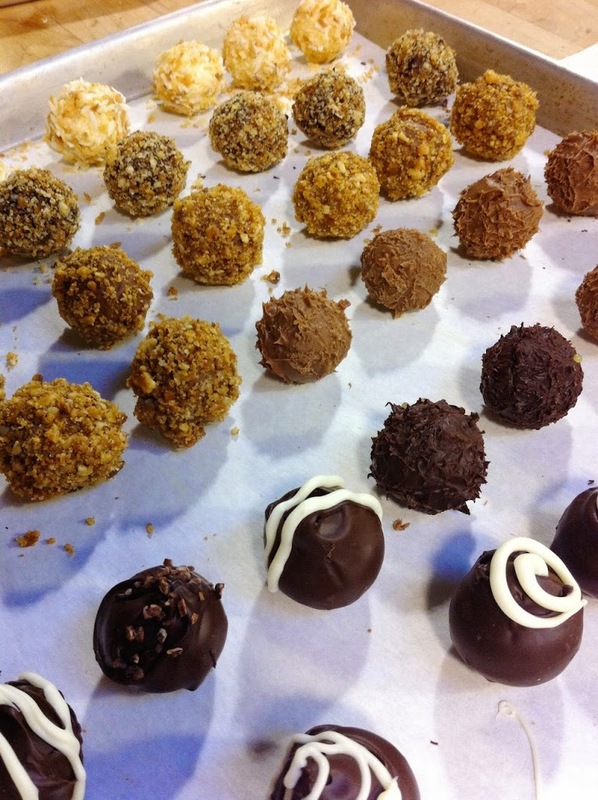 After we finished with the marzipan, we went back to the rum balls from yesterday. 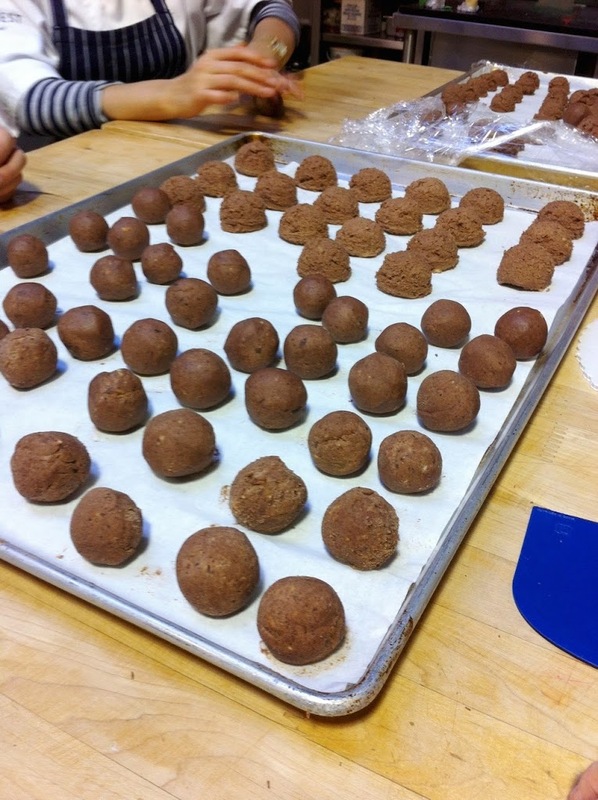 They’d been in the fridge overnight to stiffen up and we had to roll them into actual balls today (we used a cookie scoop yesterday so they needed a proper shaping). 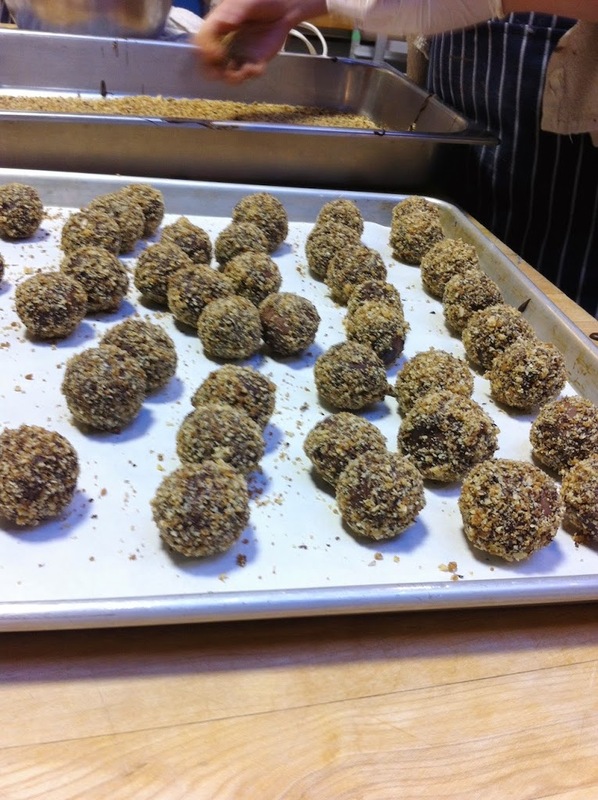 Once rolled, they got covered in chocolate and any leftover toppings we had from the truffles earlier in the week. Oh we also made some pastillage that we’ll be using next week and baked the brioche bread. 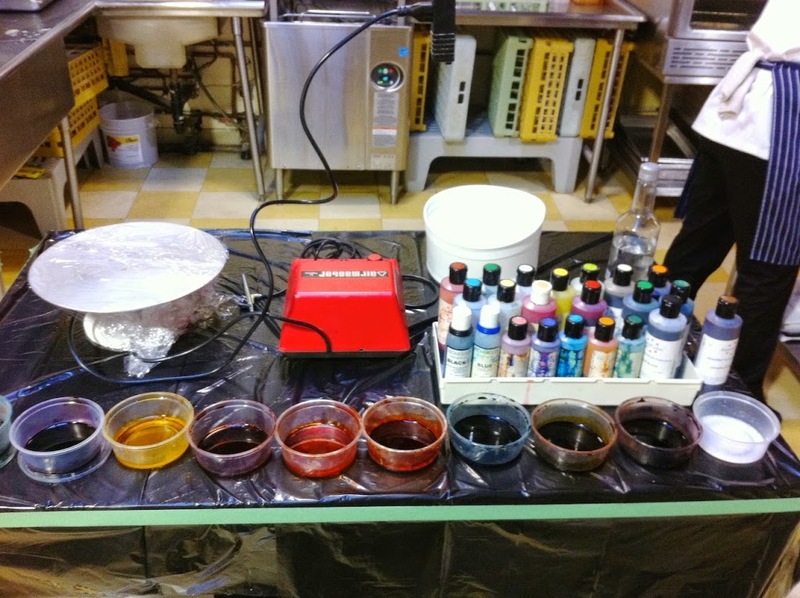 I’m happy that chocolate week is over… and even though I didn’t love it, I learned a lot and overcame some fears when it comes to chocolate work. I CAN temper at home (if I want to). I have the skills to do that now, so that’s a huge plus. That Pecan Butter Crunch is calling my name, might have to make that for the holidays….I went to the Circle Craft Christmas market yesterday with my friend Karen. The highlight of the market is usually the food/goodies section and that’s usually where I end up spending my money. One of the first vendors we stopped at gave us a sample of some amazing almond bark. It was dreamy. 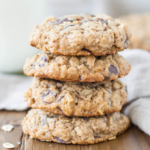 I was reaching for my wallet with the bark still in my mouth and I realized… wait a minute… this is SO similar to the Pecan Butter Crunch we made this week. 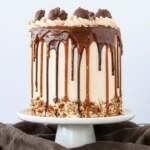 I could totally make this. 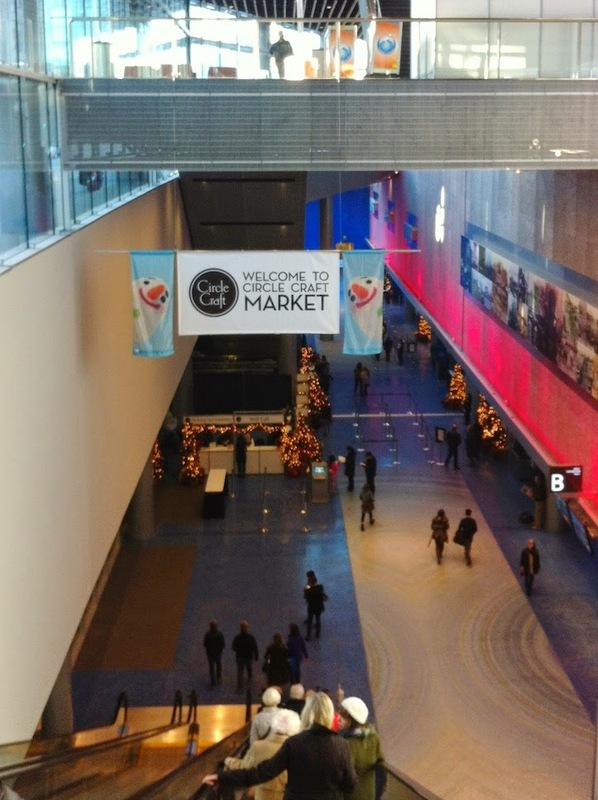 Same thing for all the chocolates we saw, and cookies, and macarons…. I skipped on everything I normally would have shelled out money for knowing I could (and will) make it at home. It was a great feeling! Ok, I didn’t skip everything. I bought shortbread cookies from this one vendor that I’d purchased from last year. Their cookies were so delicious and I didn’t mind spending the money on them. 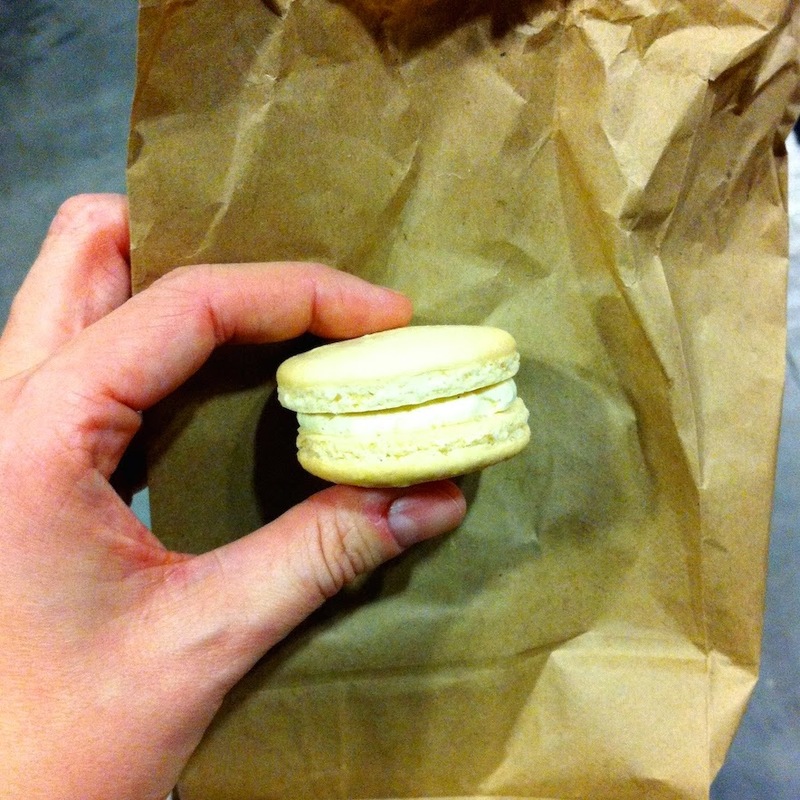 They also had branched out into macarons this year so I naturally had to try one. Sorry for the blown out pic! 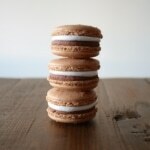 The vanilla macaron was a disappointment. 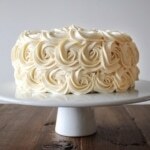 It was filled with buttercream and very sweet. Neither of us liked the taste of it and, to be honest, it wasn’t the prettiest looking macaron. The standards were not high here, clearly. And unfortunately, the shortbread cookies were a bust as well. I remember them being better, so maybe they changed something. Or maybe I’m just a huge pastry snob now after a couple months of pastry school. Who am I kidding, we know it’s probably the latter!